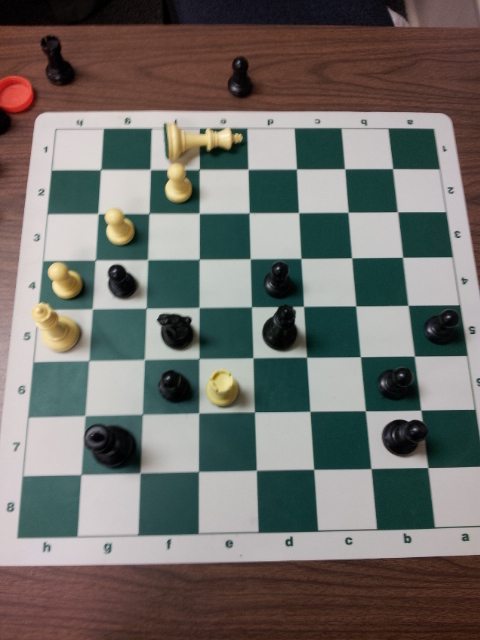 Pittsburgh Chess Club Championship 2013, Round 6: Winning as Black like a madman! 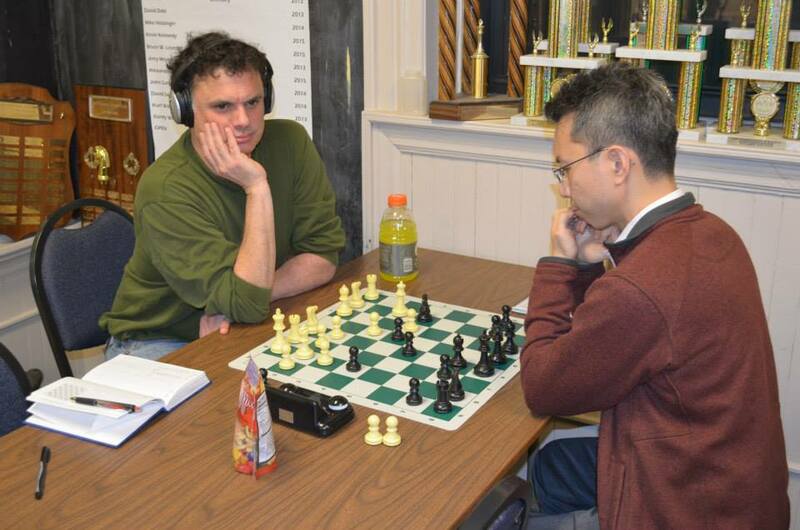 In the 6th and final round of the Pittsburgh Chess Club Championship of 2013, I was Black against Kurt Wallnau, as I mentioned I would be in my report on round 5. I’d promised him before the game that I was going to play for a win as Black (Black is OK! ), even though I only needed a draw to secure undisputed first place in the tournament, since I went into the final round one full point ahead of him. I played aggressively like a madman and brought home the full point, thereby becoming the Pittsburgh Chess Club Champion of 2013! I have to admit that objectively, my opening choice was risky, but I’ll explain why I played so wildly as Black. At your convenience, you can enjoy playing over the game with my annotations, including diagrams. As I mentioned last week, I have played one tournament game against Kurt before, and I lost that game. So yes, I was out for revenge. I had no time to prepare any particular opening surprise against Kurt, because of the personal emergency that Abby and I have been dealing with for over a week now (her fracturing a foot last Monday), the consequence of which our lives have (temporarily, we hope) turned upside down! I was very happy that only one game remained in this tournament. Immediately after the accident, I had informed the captain of the Pittsburgh Chess League team I’m on that yet again, I was not going to be able to play in the month’s round (which is next Sunday). That means I’ll have missed the December, January, and February rounds because of unforeseen circumstances. All I can say is that the only preparation I’ve had in the past two rounds has been doing a ten-minute meditation at home half an hour before the round began, in order to calm myself after a very stressful and tiring day. Amusingly, it did not matter that I did not prepare anything against any of what I remembered Kurt’s opening repertoire to be, because he played something I’d never seen him play before, Nf3, going for a Reti! So he was the one who “surprised” me, rather than vice versa. Or so he thought. I “threatened” to go into an ultra-aggressive reversed King’s Indian against him (normally Black does not play the White side of a King’s Indian one tempo down), and he allowed me to do so, and so I did! I was inspired to do this by profoundly technical as well as philosophical thoughts both by András Adorján and John Watson about the nature of playing Black in “reversed” openings. The idea is that in many variations, being one tempo down is not necessarily a disadvantage, because White’s extra tempo means having committed to something, and therefore “giving” Black some information that can be useful. In this particular case, for example, I started off with a reversed Averbakh variation, but then because I had not yet committed to putting a Bishop on g4 or on e6, and White has committed to castling already, the flank attack g5 looks interesting, because of ideas Black might have of not only getting in g4, but maybe also prying open the h file while lifting the Queen possibly to d6 and to g6. The point is that there are very concrete reasons to justify this bizarre attack. This is not to say that it is entirely sound (I don’t believe it is! ), but at least this attack has some real basis. I should note that John Watson’s book “Secrets of Modern Chess Strategy” was the single primary reason for my returning to serious chess play in 2005 after twenty years of absence: I had accidentally come across this book in a book store and been so profoundly captivated by it that I bought it (and also “Chess Strategy in Action”) and completely altered my perception of the concrete beauty and excitement of chess. In any case, I also played g5 because I was sure that Kurt would be completely surprised by it: he may have surprised me first, but I was going to surprise him in return! But I got cold feet and decided to try to castle. This was actually a serious mistake and led to very frightening positions in which I was not confident that I would be able to defend against White’s initiative. After much complex play, we arrived at an important position in which the question is, how can White continue to press? I was finally feeling safe in the game. White then blundered away two pieces (the Knight on b5 and the Bishop on d5 for a Rook. After this, I was finally happy, knowing I had a completely won game. The only question was, how to consolidate? It turned out that we both started running low on time, and also I started playing less than perfectly. I was obsessed with winning the d5 Pawn, but it was not really necessary to go for that in order to win the game. Focusing on the passed Pawns on the Queen side was best, because White could not break through on the King side anyway. There’s not much use “preparing” anyway against an opponent who plays all kinds of openings, not just a narrow set. When playing a “reversed” opening, Black may have subtle additional opportunities to complicate the game. When on the attack out of the opening, getting cold feet and not continuing it can result in much pain. White lost a long-held advantage and then quickly blundered badly; this flow of “momentum” is a common feature of chess games between humans. Black also lost some momentum after achieving a won game, but managed to keep the winning advantage. Here is the final rated crosstable for the Pittsburgh Chess Club Championship. As a result of my winning all six games, my rating has finally bounced back upward, from 2126 to 2164: I defeated opponents rated 1728, 1947, 2050, 1999, 2072, 2077. My lifetime peak was in 2008 when I reached 2197 (3 points short of getting a US Chess National Master title). I felt proud of myself for playing hard for the win and not for a draw as Black when I did not need to for tournament purposes. I am of course ecstatic that I finally won the Pittsburgh Chess Club Championship again, and that I played fairly well in this tournament, after so many years of not really performing anywhere near how I used to. In August I wrote about my goals in returning to tournament play again and the Tuesday night tournaments in particular. Despite not playing as well as I knew I could in the first two tournaments, because of poor time/energy/psychology management, I finally got my act together and played reasonably well in this one. I wish I could say that I look forward to continuing my “streak” soon, but the reality is that in January, I had already decided, well before the conclusion of this tournament, and before Abby’s fractured foot, to stop playing in Tuesday night tournaments for several months, until possibly fall. At the time, I had already concluded that I have many projects to work on in the coming months, and it’s really been quite difficult to squeeze in the time and energy to play in Tuesday night tournaments, especially given how my games seem to always last past 11 PM, and that messes up my ideal sleep schedule. As explained in my August posts, I no longer have any particular rating or title goals; I found that having them backfired badly on me. I will never again play competitive chess with any goals other than to play logically and creatively to the best of my abilities given my real life constraints. So much for giving up competitive goals: two years later, I made a focused push, temporarily putting many things aside in my life, in the fall of 2015 to achieve my US Chess National Master title, and finally made it, a dream come true. However, during all this time, my real passion for chess has always been the teaching that I started in 2013. I would like to thank tournament director Mike Holsinger for doing a fine job running yet another Tuesday night tournament, handling pairings and attending to players’ questions during rounds. It is quite a commitment to direct a tournament for six straight weeks! I would like to thank all of my opponents, as co-creators of these fascinating games that we have played together. I would also like to thank everyone who follows my chess postings on my blog and has encouraged me to do chess writing. Finally, I dedicate the win of this tournament to Abby, who has never seen me win a Pittsburgh Chess Club Championship since we’ve known each other, and supported my effort this year to finally win it again. I enjoyed the really tense game with Kurt in the final round, in which he applied considerable pressure that forced me to think very hard. 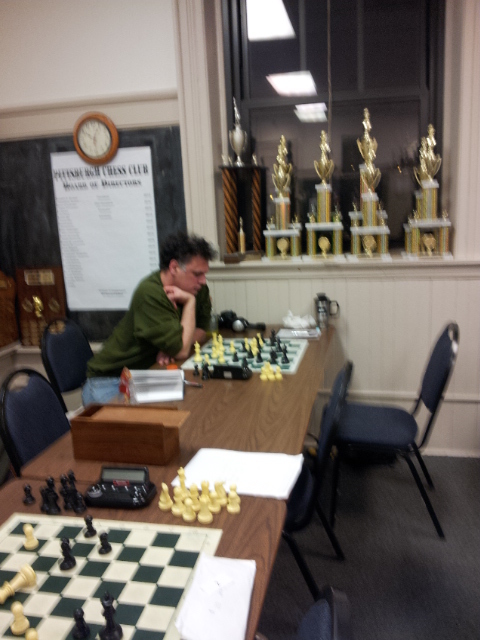 I had a great time playing in the Pittsburgh Chess Club Championship of 2013, and managing to win it. Although I’m taking a break from tournament chess, I’ll be back!